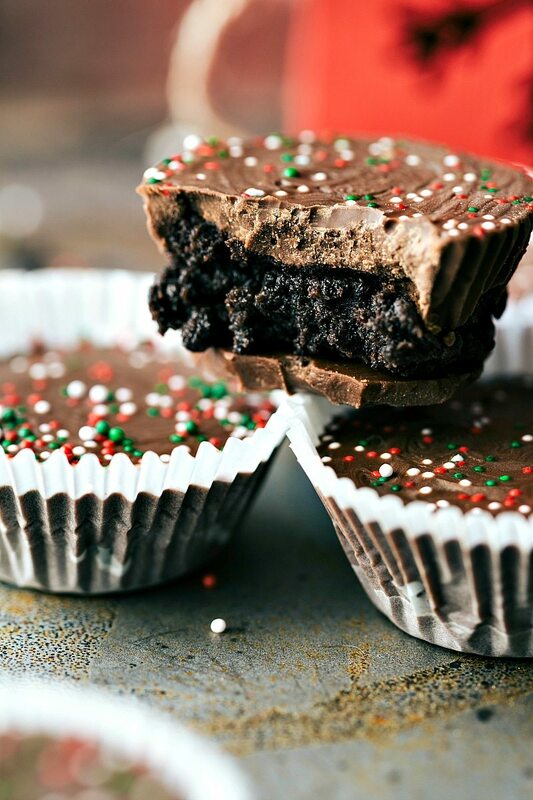 THIN MINT OREO CUPS – 2 WAYS! Oreo crumbs mixed with crushed peppermint surrounded by mint chocolate baking chips resulting in a burst of pepperminty-chocolate flavor. These thin mint oreo cups require no baking and only three ingredients! The first is just like I described. Chocolate + Oreo/Peppermint ball + more chocolate. Done. The next is using white chocolate instead of the Andes Mint Chocolate. You prepare it pretty much the same except you melt 1/2 cup of white chocolate chips with 1 tsp. vegetable oil and then put white chocolate-oreo/peppermint ball-white chocolate. Done. Line a mini muffin tin with mini muffin cups. Set aside. No need to separate the oreos - you'll use the cookie and the creme. Pinch off little balls of the dough and roll into small circles. You should have about 22 circles total. Flatten the circles to be the width of the mini muffin cup. In a small microwave-safe bowl, melt 1/2 cup of Andes chocolate chips for 30 seconds. Remove from the microwave and stir for 30 seconds and then return for 15 more seconds if they aren't all the way melted. Pour enough chocolate to barely coat the bottom of the muffin cup. Press the oreo-peppermint dough into the chocolate. Pour more chocolate to cover the oreo-peppermint dough completely. If desired add some Christmas sprinkles. If you want to do white chocolate ones, use the same instructions except melt 1/2 cup of white chocolate chips with 1 tsp vegetable oil at a time. 1/2 cup of white chocolate will make about 6 candy cups, so you will want to adjust accordingly if you want to use all of the oreo dough for white chocolate cups. 0 Response to "THIN MINT OREO CUPS – 2 WAYS!"